What's the Best Dog Food for Chihuahuas? Your chihuahua is a high-energy dog that makes a fantastic companion dog for single people and elderly people due to their small size and excitable natures. However, your chihuahua needs a special diet to accommodate their small size and their fast metabolisms. Finding the best dog food for chihuahuas can be challenging due to the sheer number of factors to consider as well as the dozens of types and brands available. We'll help you by putting together a buying guide to show you what to look for when you shop as well as round up and review the top six dog foods for chihuahuas. Your chihuahua needs a diet that is specially formulated for their high energy levels because this will help them get to and maintain a proper body weight. 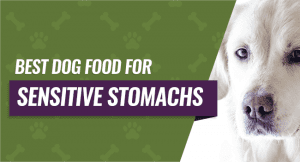 It'll also help to ensure that your dog is getting all of the nutrients that they need to thrive and be happy and healthy throughout their lives. There are several stages to your dog's life, and there is a dog food for every stage that is specially formulated to support them as they grow and age. This will help to ensure that your dog continues to get the correct vitamins, minerals, and nutrients that they need from the puppy to senior stage. The first thing that you want to look for in your new chihuahua dog food is the nutrient count. This is important throughout your dog's life, but you want to pay close attention during the puppy stage and during the senior years. You want to pay attention to the source of the carbohydrates in your chihuahua's food to ensure that they're high-quality. Good sources of carbohydrates include brown rice, root vegetables, and flax seed. The higher quality the carbohydrate sources are, the easier it is going to be on your dog's stomach when they digest it. Carbohydrates provide your dog's body with energy in the form of sugars as well as providing structure and texture to your chihuahua's food, so they're more prone to eat it. Even though chihuahuas can be prone to gaining weight and getting slightly chubby, they still need good fat in their dog food. Good fat content has several health benefits for your dog, and your dog food should have between 25 and 30 percent fats. Not only do fats help your chihuahua gain and keep their weight levels up, but it also includes fats like Omega-3 and Omega-6 fatty acids. These fatty acids provide an energy source for your dog as well as helping to repair and maintain your dog's cells, body tissues, nerves, brain function, and muscles. The first thing you want to look for in your chihuahua food is the protein percentage in every serving. This tiny dog breed burns through a lot of protein as they go about their day, and they need to replace it when they eat in order to keep their energy levels up. A high-quality food that is formulated for small and high energy dogs should have at least 30 percent protein levels. If you can't find one with this protein count, 25 percent will also suffice to keep your dog's energy levels up. Protein helps your dog's body produce enzymes and hormones that it needs to keep functioning at optimal levels. It also helps to support a healthy immune system, maintains cell health, and helps to keep your chihuahua's skin and coat healthy. Once you've taken a look at the main categories of your chihuahua's food, you want to focus on the other essential factors to be sure that you get a balanced food. Chihuahuas are a tiny dog breed that weighs in at around 10 pounds. The amount of food you feed them will depend on their age, weight, bone structure, and the specific food you choose to feed them. It's also best to feed your dog smaller meals throughout the day instead of larger meals because this can reduce the chance of digestive problems. Most dog food packages will have a feeding chart or guidelines that you can follow when you feed your dog, or you can ask your veterinarian how often and how much you should feed your chihuahua. Chocolate - Chocolate contains an ingredient called theobromine. This is poisonous to dogs, and smaller dogs are more susceptible to negative side effects including vomiting, diarrhea, and lethargy. Caffeine - Your chihuahua is high-energy enough without adding caffeine to their diet. Caffeine can also raise your dog's heart rate to dangerously high levels. Chicken Bones - The correct type of bones can be beneficial to your dog. However, chicken bones get brittle and and prone to splintering when your dog chews on them. Onions - Onions contain thiosulfate, and thiosulfate can be toxic to both cats and dogs. If your dog gets enough of it, it can cause anemia. This adult dog food comes in 14 different flavors with six dedicated to small and toy dog breeds. You can buy a variety of sizes as well starting at four pounds and going up to 16 pounds so you can customize your order to suit your situation. 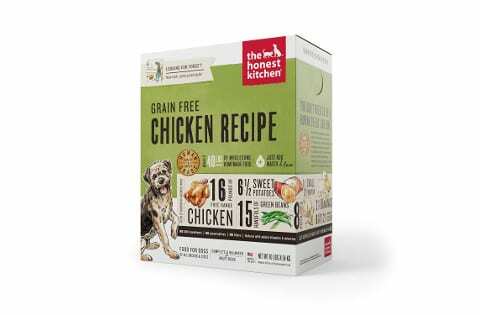 Real meat (chicken) is the first ingredient in this dog food, and it also contains a healthy mix of fruits, vegetables, and carbohydrates that are specially formulated to keep up with a smaller dog. Your dog will get an exclusive blend of Blue's LifeSource Bits that contain minerals, vitamins, and antioxidants that help maintain a healthy weight. People who purchased this product liked that it came in several different size and taste options so they could try out a few on their dogs. They didn't like that this dog food could have a strong fishy odor when you first open the bag that tends to linger. This dry dog food features smaller kibble pieces that are perfectly formulated for senior dogs. This dog food promotes good digestive health with natural probiotics and fiber, hip and joint health with glucosamine and chondroitin, and weight maintenance with lean protein sources. 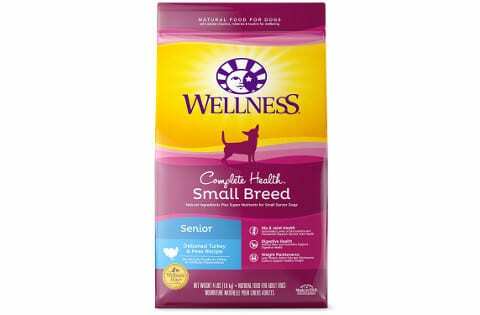 It is formulated to be healthier for your senior chihuahua to digest with no artificial flavors, preservatives, colors, dyes, meat by-products, corn, soy, or wheat. This food is made in the USA to strict quality control standards, and it comes backed by a manufacturer's Wellness Guarantee. Pet parents who purchased this chihuahua dog food liked that it was designed to support healthy joints and bones in their older dogs and that it was easy for them to digest. They didn't like that the kibble pieces were slightly larger and very hard because this made it difficult for their dog to chew. You can choose from four different types of puppy food with this choice including a puppy kit, four different flavors, and seven different size options. It's recommended for small breed puppies up to a year old, and it contains high-quality DHA from fish oil supplements. This puppy food supports healthy brain, eye, and skeletal development along with an easy-to-digest formula that is gentle on your puppy's stomach. It contains vitamins, minerals, antioxidants, and amino acids to support a healthy immune system and optimal growth without any artificial colors, dyes, or preservatives. People who bought this food for their puppy liked that it has several style choices including a wet and dry meal along with several different flavors. They didn't like that it can have a strong smell or that the small bites are slightly larger in size. This dehydrated dog food makes up to 40 pounds of dog food with a single 10 pound box. You get four different size options along with four different flavors so you can customize it to suit your picky eater. This dog food is very easy to make, and you know that your dog is getting great quality because this company meets rigorous FDA standards and requirements when they manufacture their food. It is formulated with no by-products, GMO ingredients, and preservatives, and all you do is add warm water. 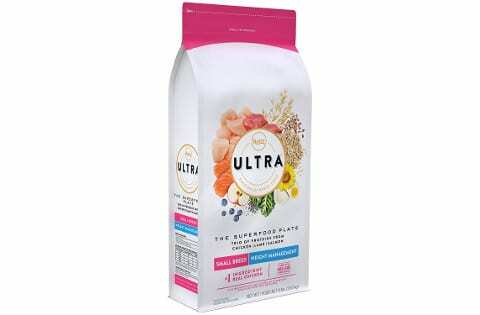 Pet parents who bought this dog food liked that it is very easy to make, and they also liked that it is made with human-grade ingredients. They didn't like that you lose some of the vitamins and nutrients as the food goes through the dehydration process. This small breed weight management dog food comes in three different sizes and two different types that allows you to customize it to your dog. Your dog will get balanced and complete nutrition with a trio of lean protein sources including chicken, salmon, and lamb. It's also formulated with over 15 different superfoods including blueberries, chia, coconut, kale, and much more to kick-start your dog's weight loss and boost their immune system. There is no chicken by-product meal, corn, soy, wheat, artificial dyes, preservatives, or colors for a healthy diet choice. 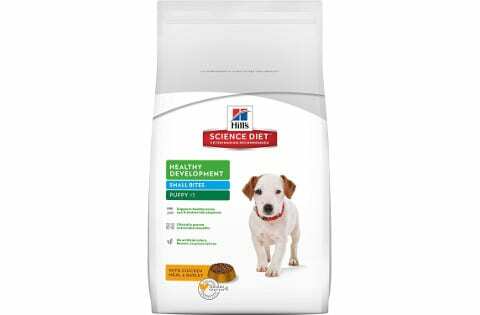 Pet parents who purchased this weight management dog food liked the fact that it contains a trio of lean protein sources combined with 15 different superfoods to boost their dog's system. They didn't like that the recommended feeding amount seemed to make their dog maintain or even gain weight. This dry dog food is specially designed for sensitive stomachs and sensitive skin with a gentle rice and salmon formula. It comes in a 30 pound bag, and it is packed with probiotic fiber that supports healthy digestion and a regular digestive tract. Your dog will also enjoy oatmeal, fish oil, sunflower oil, and more to maximize and regulate your dog's system to help with any allergies or sensitivities they may have. There is no soy, corn, wheat, dyes, preservatives, or meat by-products, and this means that it's a healthier option for your dog. Pet parents who bought this dog food liked that had a very healthy and nutritious formula without any grains or by-product meal. They didn't like that there was a slightly longer adjustment period where their dog seemed to have an upset stomach. 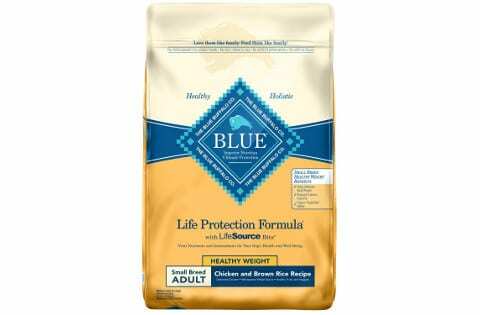 Our pick for the best dog food for the chihuahua breed is Blue Buffalo Life Protection Formula because it comes in several different flavor and size options that allow you to quickly and easily customize your order to suit your dog's needs. It comes formulated with a real meat as the first ingredient, and there is also a healthy mix of vitamins nutrients, and Blue's LifeSource Bits to give your dog total support. You'll also find antioxidants packed into this food formula, and these antioxidants help to support a healthy skin and coat. 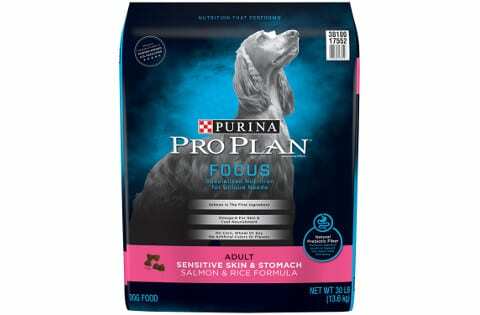 Overall, this dog food is a great choice to help get and keep your chihuahua safe and balanced throughout their lives.